A new study reveals phytoplankton spring blooms in the Arctic Ocean, which were previously nonexistent, are expanding northward at a rate of 1 degree of latitude per decade. This news article was issued by the American Geophysical Union (AGU) as a press release on 15 October 2018. Phytoplankton blooms that form the base of the marine food web are expanding northward into ice-free waters where they have never been seen before, according to new research. A new study based on satellite imagery of ocean color reveals phytoplankton spring blooms in the Arctic Ocean, which were previously nonexistent, are expanding northward at a rate of 1 degree of latitude per decade. 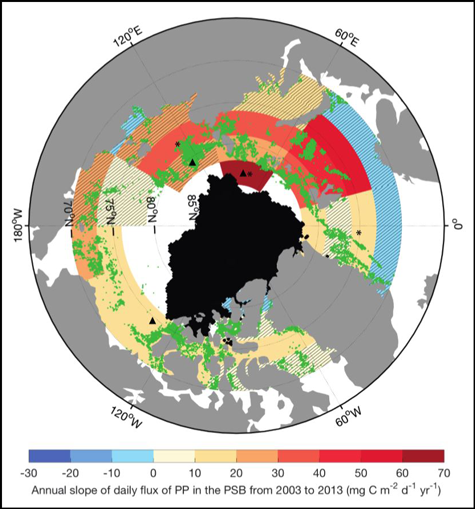 Although blooms, or large explosions of phytoplankton, did not previously occur in this area, phytoplankton were present in the Arctic’s central basin at low biomass. The study also found the primary productivity of the phytoplankton, or the rate at which phytoplankton are converting sunlight into chemical energy, is increasing during the spring blooms. The decline in Arctic sea ice over the past several decades has made way for areas of open water where phytoplankton can thrive, driving their northward expansion, according to the study’s authors. The researchers are unsure what effect this expansion will have on the food web, but the results suggest the decline of ice cover is impacting marine ecosystems in unforeseen ways. If sea ice continues to decline, it could drive phytoplankton spring blooms farther north and increase primary productivity even more. These changes could affect the fate of the Arctic Ocean as a carbon source or a carbon sink, according to the study. Phytoplankton are microscopic organisms that live in water, consume carbon dioxide and release oxygen through photosynthesis. In this process, they convert sunlight into chemical energy. Phytoplankton form the base of the marine food web, indirectly feeding everything from small fish to multi-ton whales. Phytoplankton growth depends on the availability of carbon dioxide, sunlight, nutrients, water temperature and salinity, water depth and grazing animals, according to the NASA Earth Observatory. When conditions are ideal, phytoplankton population growth can explode, or bloom. While a bloom may last several weeks, the lifespan of an individual phytoplankton is seldom more than a few days. Phytoplankton in the Arctic Ocean typically bloom every spring. In the past, phytoplankton blooms have been virtually absent from the highest Arctic latitudes, because these areas are usually covered by sea ice. In recent decades sea ice has declined, breaking up earlier in the spring or not forming at all in some areas of the Arctic. In the new study, Renaut and her colleagues wanted to see if recent sea ice declines have had any effect on spring phytoplankton blooms. They used satellite observations of ocean color—which provide estimates of phytoplankton biomass and primary productivity—to track changes of the blooms each spring from 2003 to 2013. They found the spring blooms are expanding farther north and increasing in primary productivity. In the spring and summer months, net primary productivity in the Arctic Ocean increased by 31 percent between 2003 and 2013, according to the study. The researchers also found that these blooms in the Barents and Kara Seas, north of Russia, are expanding north at a rate of 1 degree of latitude per decade. Sea ice melt occurring earlier in the season creates larger open water areas that act as incubators for phytoplankton growth and elongate their growing season, according to Renaut. The authors suspect spring blooms could someday extend into the Arctic’s central basin, which encompasses almost everything north of 80 degrees latitude. Primary productivity, though, would likely remain low due to a lack of nutrients. Less ice cover means spring blooms and under-ice blooms may also have to compete for light and nutrients, thus altering the flow of the marine ecosystem. The results suggest a large change in this region, which has never been free of ice cover. Patricia Yager, professor of Marine Sciences at the University of Georgia who was not involved with the new study, said the earlier algal bloom growth they observed in some areas could have considerable impacts if animals are not yet ready to graze on the phytoplankton. Cecile Rousseaux, a research scientist at the Universities Space Research Association, who was not involved in the new study, said the study advances research in this area by investigating individual regions of the Arctic for phytoplankton productivity, and represents evidence of the effects that reduced ice cover have on the biochemical cycle of the Arctic Ocean. However, Rousseaux noted that the study does have limitations.